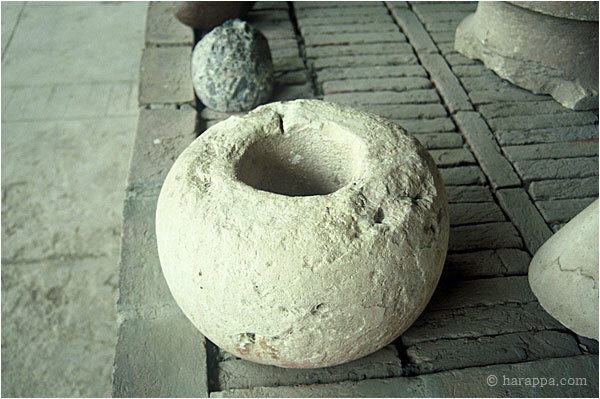 Numerous ringstones made from white limestone have been recovered from Mohenjo-daro. Sometimes several have been found together, but none are in their original position of use. Discoveries of similar ringstones in the gateways at the site of Dholavira (See the Ancient Indus Region Map in Indus 2, Slide 71.) suggest that they may have been used as the base of wooden columns. Small dowel holes are often found on one side. It is possible that several of the ringstones were stacked with a wooden pole running through the center. A miniature version of such a ringstone column made from shell rings has been reported from the site of Dholavira.